In 1996 I began a Masters in Film Studies at York University, Toronto, with a plan to write my thesis on Jean-Luc Godard’s post-Dziga Vertov Group work. The ability to graphically interface with the World Wide Web was still in its infancy, and the notion that anyone could create their own website was not yet quotidian. I was interested in experimenting with a site reflecting, in some fashion or another, my interest in Godard. Since I was a poor graduate student, I chose GeoCities as a host; they offered free space in exchange for some banner ads and control over the URL. Originally conceived as part of a larger project of director pages called “The Pantheon” (Sarris reference intended) which never came to full fruition, Cinema=Jean-Luc Godard=Cinema was initially given an awkward “Hollywood” address: geocities.com/Hollywood/Cinema/4355/. This is the URL listed under “Weblinks” in the 2001 Fox Lorber DVD releases of Breathless, Le petit soldat and Les carabiniers (not that they asked, or even let me know of their intention to link my site). In 1999, Yahoo acquired GeoCities and soon after changed the URL to geocities.com/glen_norton. This first incarnation was archived by OoCities.org in 2009 when it was announced that Yahoo would be ending its GeoCities hosting services. In October of that year the site’s second incarnation, with a more focused mandate as an “academic hub for information and discussion”, was created on WordPress. To be quite honest, when I first began I wasn’t sure what the site was going to “be”. There were no rules. I do remember, however, that Alan Liu’s Voice of the Shuttle, which had already been in existence for a couple of years, was inspirational both in its capacity as an academic resource and for the embedded list structure of its content. In retrospect, my initial self-imposed mandate was based in part on what Liu was doing: link every scrap of information I could find pertaining to Godard. Over time this information was streamlined into various sections: interviews, essays, reviews, images, film clips (a rarity in the early days), scripts, letters, latest news/gossip, etc. My headings were dictated by what I could find. The dearth of information on the web caused me to be fairly indiscriminate at the outset, and thoughts of legality or ethics rarely crossed my mind. If it was on the web, I assumed it was fair game. I’ve never had an issue with the site in this regard; no one has ever asked me to remove a link or an image. Hosting work other than my own was (and still is) not a priority, save for a few uploaded interviews, the origins of which I’ve long forgotten (I certainly don’t remember transcribing them myself). My early method for finding information was quite primitive: a repeated search for “Godard” on the various engines available at the time (AltaVista, Lycos and Yahoo were my mainstays). This inefficient method was at first an all-consuming obsession; later, however, it simply became a nuisance. I just didn’t have the patience, so I wouldn’t bother to update the site for months on end. I thankfully now rely for the most part on Google Alerts. I must also acknowledge the numerous well-informed and gracious members of the Godard Mailing List, created by Gloria Monti around the same time as my site (and now undergoing a reincarnation of its own), for bringing important items to my attention. At first my trawling for all things Godard-like came up with little more than various film blurbs and reviews which I linked to a filmography, some barebones interviews (for the longest time, the only one I could find was from the 1995 Montreal Film Festival), and a handful of essays (again, for the longest time the only scholarly essay I could find was “Scandal to the Jews, Folly to the Pagans: A Treatment for Hail Mary,” by Stuart Cunningham and Ross Harley, perhaps the first openly web accessible essay on Godard). Early versions of the site also hosted some now slightly embarrassing undergraduate essays I had written on Godard and others. The fact that what I uploaded might remain indelible was not much of a concern; the Internet was a brand new toy to play with, and its long-term implications were simply not evident (at least to me) at the time. Around the time I changed hosts I also dropped the “Jean-Luc” in order to streamline the title. By then I found it illogical and more than slightly pretentious (and still do – why two equals signs? ), but I was hesitant to change it any further. For better or worse, it was under this name that the site had become known. Indeed, over the years I became increasingly aware that the site really was becoming more and more well known. My labour of love was showing up earlier and earlier in my Godard searches, eventually becoming one of the top results. 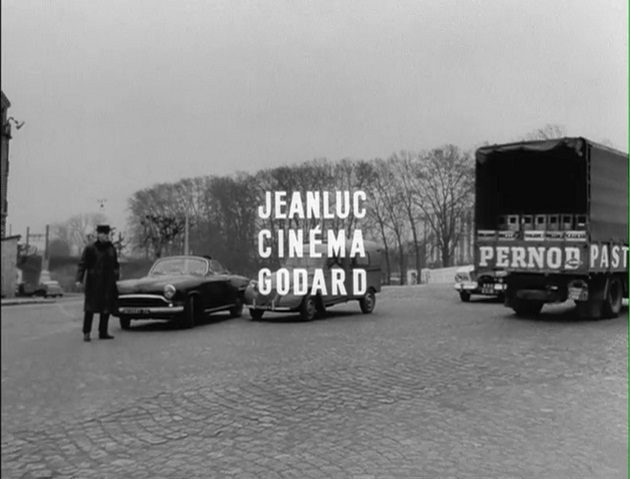 I was surprised to find it regarded more and more as the web authority on Godard, even though other important sites had begun to appear, such as Julien d’Abrigeon’s Jean-Luc Godard, Cineaste-Ecrivain, along with countless more that have come and gone. From the beginning I’ve remained adamant that the site should be interactive, so my email address has always been available on the front page – a practice that has resulted in countless requests for me to “pass along” information to the man himself (no, I have never met Godard, and no, I do not have any “special” way to contact him). During the dot-com boom of the late 90s the site was even popular enough to be approached by some now long-forgotten online store, which offered me one free movie of my choice per month in exchange for a banner ad. This deal lasted long enough for me to “earn” VHS (yes, VHS) copies of Bresson’s Une femme douce, Altman’s That Cold Day in the Park, and even Godard’s For Ever Mozart before the bubble burst. Apart from the mandatory banner system implemented by GeoCities and then Yahoo, this was my first and last attempt at making the site “commercial”. The second incarnation of the site is dedicated to open access information of academic import and interest. I do still try, of course, to report on the latest news about Godard and his work, but I am less inclined now to discuss rumours, gossip and other incidental items unless I think it is truly warranted. This is not a fan site in the adoring or reverential sense; my interest lies primarily with the work and not the man himself. Take, for example, the infamous “anti-semite” charge in late 2010, sparked, it seems, more by Godard receiving a Governors Award and then declining to attend the ceremonies than by any solid evidence. I was preparing a scholarly response looking at what the films themselves might have to say on the subject, but in the end opted for an approach outlining my take on the relationship between film authorship and scholarship in general. The most recent “rumour” (at the time of writing) which seemed worthy of a posting was the May 2012 report from production/sales company Wild Bunch that Godard’s next film, Adieu au langage, would be shot in 3D. Although this rumour had been circulating since 2010, the claim initially seemed suspect, since Wild Bunch immediately removed any reference of the film from their website. Subsequent news about technical aspects of the film, along with the fact that Wild Bunch has since restored the film’s webpage, attests to the fact that Godard in 3D will indeed become a reality. Comprehensive realtime reporting on ongoing rumours such as these was simply not possible in the early days of the site. I am not opposed to posting this type of information, but the site’s permanently nested pages now remain dedicated exclusively to open access items of scholarly importance: a list of books (including links to chapters and reviews); conference announcements, calls for papers and reports; a list of dissertations and theses (including links when possible); and scholarly essays listed by journal. These headings are by no means set in stone; I am always searching for ways to make the site more logical and streamlined. For example, I’ve been toying with the idea of creating a separate “calls for papers” section, as well as perhaps dividing the books section into sub-sections on chapters, languages, etc. Currently, even though I remain highly skeptical about their scholarly value, I keep a page dedicated to interviews. Godard’s cryptic pronouncements and observations are fascinating, to be sure, but it is highly doubtful they should be taken at face value, especially in a purely academic sense. My intention is to keep the site’s second incarnation guided by an ethic that balances academic interests with concerns about open access. This ethic is certainly evolving, as are opinions about open access, so for now I operate on a case-by-case basis. I still remain adamant that the site should, for the most part, not host work other than my own. I have been hesitant to link to anything in Google Books – for now it remains an awkward interface, often with sections missing, and questions of copyright still linger. Print material is still the main focus of the site, but it seems I will have to rethink this approach in the near future. I have so far disregarded the myriad of films, interviews and other relevant Godard clips that exist on sites like YouTube and Vimeo – it is a daunting task to keep up with the speed at which information is posted and removed on these sites, and I simply do not have the time to catalogue and link everything. Again, I approach what to include on a case-by-case basis. If I find what to my mind is a relevant piece – for example, A Weekend at the Beach by Ira Schneider – I do try to post about it, but so far I have not had time to devote an entirely separate section to moving images. Cinema=Godard=Cinema has gone hand-in-hand with my academic life for so long that I have difficulty considering it as “pioneering”. I am still amazed when others mention how their work has benefited from it. When I do get the occasional note of thanks, or when those who have devoted much more energy to open access (such as Catherine Grant with her invaluable work on Film Studies For Free) cite it as an inspiration, I am not only flattered but truly surprised. It has been fascinating to watch how this occasional hobby of mine has transformed over the years, eventually taking on something like a life of its own. Since ideas about open access are continuing to evolve, who knows what the site might become in the future? I am not ruling out a third incarnation.